Anyone have a nice recipe? Sort and wash beans. Place beans into a bowl and cover with water about 2 inches above beans and leave overnight. Place beans without the water into a crock pot dish. Now add 8 cups water and all the other ingredients. Cover and place on low temperature. Simmer 2 1/2 hours or until vegetables are tender. Place soup into bowls and serve. This recipe was submitted from Tana, a daily recipe subscriber. In a soup pot mix onion, potato and chicken stock; bring to a boil. Reduce heat and simmer 10 minutes. Add celery, green beans, cabbage or spinach, carrot, sweet pepper, dill and beans. Cover and simmer 10 minutes or until tender. Season to taste. Sprinkle serving with Parmesan. ONLY 2g OF FAT IN ONE SERVING! Pick over and rinse the beans. Put them into a large bowl and cover completely with cold water. Let the beans soak overnight (or for at least 8 hours). Drain the beans and transfer them to a medium saucepan. Add the 2 cups water and the bay leaf. Bring to a boil over medium heat and cook for 15 minutes. Reduce the heat to low and simmer, uncovered, for about 20 minutes, until the beans are tender. Drain the beans and discard the bay leaf. Place a heavy stockpot over medium heat for about 1 minute, then spray it twice with the vegetable oil. Add the broccoli stems, carrot, celery, and onion. Cover, reduce the heat to low, and cook for 5 minutes, stirring once or twice. Stir in the thyme, basil, and wine. Simmer, uncovered, for about 15 minutes, until the wine has been reduced by half. In the meantime, coat the chicken thoroughly with the barbecue sauce and bake for 10 minutes on the top shelf of the oven. Remove the chicken from the oven and allow it to cool just long enough to handle. Cut the chicken into small cubes. Add the chicken, chicken stock, and beans to the stockpot. Cook over low heat for about 3 minutes, until thoroughly heated. Stir in the evaporated milk and the broccoli florets. Cook for 5 minutes, stirring if needed to keep the soup from coming to a boil. Add the dissolved cornstarch and cook for 2 minutes more, stirring constantly. Stir in the liquid smoke, Worcestershire sauce, and Tabasco sauce. Prepare beans according to package directions by soaking in water overnight or simmering them in water for an hour, draining the water and reserving the beans in a colander. Saute onions in oil for 5 to 8 minutes over medium heat til they are soft. Add minced garlic, scallions and all of the herbs and spices, including the zest, stir and heat through for about 2 minutes. Add vinegar and stir, then add beans, stock or water and base or plain water, cover pot and bring to a boil. Lower heat to simmer. Cover pot again and allow to simmer for 11/2 hours. . Check for level of liquid occasionally. Add additional stock or water if soup appears too thick for your taste. Check beans for tenderness. If not soft, cook at simmer for another 1/2 hour. Thanks so much Anicha - they look delicious!! I guess I should've said that I'm looking for the old traditional "boerekos" recipe, where they cook some mutton with it. Do you know what I'm talking about? I have the "Groenboontjie Bredie" - like the real afrikaans one! Yes please, that's actually what I meant! DH has been nagging me for ages now to make it & I'm always finding some sort of excuse, because I didn't want to admit that I actually don't know how to make it. I do love some of Anicha's recipes though. I think these things will make great food for Reuben, especially as it's cooked quite soft. Ok it is real easy, if u have a slow cooker it is even beta! I use lamb neck as that is the best meat in a bredie, u can also make a tomato bredie, it is very similar. Fry onions and garlic, remove from pan. 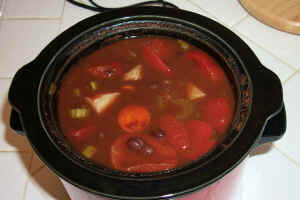 Add onions & meat to a slow cooker or steam pot, or a nice caserole dish that is oven proof. Put the beans and half of the juice(canned beans) on top of potatoes. 2 cups of water. or till the wayter covers the potatoes halfway, it does not have to be covered completely, just enough to cook in and make a sauce. Let it cook gently until soft - 30 min before serving take out the meat and most of the potatoes and some of the beans, thicken sauce with a bit of maizena and mash the remaining potatoes and beans with masher, just roughly just to give the sauce a nice texture. Add the meat and the potatoes and beans and simmer 30min. Serve with nice basmati rice. Steam pot - dunno till meat is soft. caserole pot - 2-3 hours on 150 oven! I normaly just put everything in slowcooker and dont even bother frying onions and garlic or brown meat. This is real boere kos! That looks soooooooooo yummy!! Def going to make it tomorrow night & will let you know how it turned out. PS. What's your first name again? Is it Liesl? Jip, Liesl - hey u even got the spelling right. Let me know how it is! Hubby also loves it. I am going to try this as well, looks really good. Liesl, what's the "french cut" of the tin of green beans? My dh hates "bredies", but I just love them, and my mom used to make the best green bean potjie with lambs neck as well! Oh, and if you put it in the oven, do you cover it with foil? Es, when u buy the beans in the tins there is differnt cuts, the french just looks nicer, makes no diff. DH is not keen on bredies, the first time I made it did not thicken sauce, and it was not so nice, so the second time I put some effort in the sauce and Tinus loved it, he requested the dish the other week. yes u need to cover the dish in the oven, with foil or caserole lid.